Starring Boris Karloff, Phyllis Thaxter, Martita Hunt. Written by Ida Lupino and Richard Lupino. Rich old biddy Celia Summerville (Hunt) welcomes her nephew, Rutherford (Peter Walker), the titular last of the Sommervilles, even though he's been known to spend her money on gambling and other vices. Her niece and veritable slave, Ursula (Thaxter) becomes tired of waiting for Celia to kick off and talks Rutherford into easing her into an early grave. JS: Lupino starts things off strong with an creepy scene with a woman dragging a body off to be buried. Where's Larry Pennell when you need him! PE: "The Last of the Sommervilles" goes down in history as the first prime time drama to feature, in the role of Celia Sommerville, a female poodle. JS: And what a dog she was! (Or is that Martin Short in drag? -PE) Everything about her was over the top, which made it difficult for me to initially get engaged in the show's first few reels of this episode. PE: One of the wildest rides of the 43 Thrillers we've viewed so far. The first 15 minutes had me constantly hitting my snooze alarm to wake me up. Then—boom—the damn show turns into a twisting maze that leads to an unpredictable finish. No coincidence here: the turnaround begins the moment Boris Karloff shows up. Boris turns in a strong supporting turn as the lecherous Dr. Farnham. JS: Shemp Karloff! I will admit it's nice to see him given a different kind of role to play for a change. 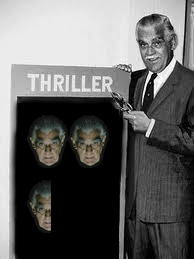 PE: I think this is Karloff's best work in Thriller so far. He's a leering skirt-chaser, but not a hammy pop-eyed perv as some of these things were played, and it just seems to elevate everyone around him. Tell me I'm wrong. This show goes from 0 to 3 stars just that quick. JS: You know they have medicine to treat your bipolar disorder. 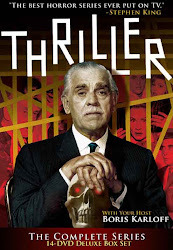 PE: Just as the drama picks up when Karloff shows, so do the performances of Thaxter and Walker (both of whom seem to sleep walk through their roles pre-Boris). Ursula has a fabulous gleam in her eye planning a murder while Rutherford talks a good talk but doesn't fool us. He's not entirely comfortable with doing away with Auntie Celia and the proof is in the pudding when the shocking murder goes down. And a brutal kill it is, despite the fact that it's handled, for the most part, off screen. JS: I don't think it's Boris showing up that got you so excited—it's no coincidence that's also about the same time Aunt Celia (Hunt) is finally off screen. I actually thought Rutherford and Thaxter were fine throughout the episode (with the notable exception of Rutherford's comeuppance - clearly he comes from the point and shoot school of firearm training). I think the finest performance may come from the uncredited, off screen leaf thrower who is called upon a couple of times this episode. PE: And how about our final scene? Sheer genius. Karloff (still in full Farnham duds) stops at the gate of the now-abandoned Sommerville estate and reveals the fate of Ursula, one of those "she got it in the end even if we didn't show it to you" Hitchcock epilogues. You can almost see the fading of the Farnham character into the Boris Karloff, "host of Thriller" persona (which is an act as well) as he's addressing us. JS: So you're praising this episode for something you've routinely criticized in the past? (I'm not praising the "justice wins" aspect but how it's handled, you ninny. -PE) Some times I don't get you, Enfantino. Not a horrible episode, but it's flaws keep it from being the three-Karloffer you want to think it is. For those of you playing along at home, Peter and I deliberately insert a typo into every post just to see if Tom is paying attention. I have to say Tom, we're very disappointed. So far you've only found what— two, maybe three typos? We've reviewed 44 episodes - time to get cracking! That's okay, you keep findin' 'em, we'll keep fixin' 'em. This is probably my favourite crime Thriller (closely followed by, from memory, 'A Good Imagination', though I'll check out 'Late Date' this week). You guys might want to stay away from David Lean's marvellous 'Great Expectations' and Fisher's 'The Brides of Dracula', which the magnificent Martita Hunt also graced. One thing that one has to say, is that Lupino's shows sure have a high calibre of performances and this gothic showcase is no exception. She has an unerring way of framing her two-shots to evoke a sinister conspiritorial ambiance. The whole thing positively drips with a delicious corruption. And Karloff and Hunt balance off each other beautifully, as does Walker's Rutherford and Thaxter's Ursula. Yeah, they're a drag but I like to think we offset it with our in-depth, biting, pensive, hard-hitting, penetrating and insightful analysis. Why else would we attract professionals like Tim Weaver, Tom Lucas, and David J. Skal? Martin Short in drag, indeed! A pretty funny take on Ms. Martita Hunt, whose appearance here in "Thriller" provides us with another "teachable moment", 'specially for you young'uns out there. It's another showcase role for a distinguished Thespian whose legacy is now given a chance at extended life, thanks to this DVD set. 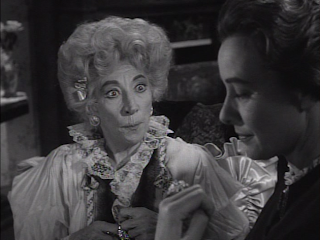 (Check Ms' Hunt's IMDB credits, including the role of Miss Havisham in Lean's 1946 "Great Expectations"). So you guys couldn't wait for her to get off the screen, eh? Well, its' understandable, I guess; she's an awfully looney old bird. The problem with watching a "Thriller" per-day is the difficulty in distinguishing one episode from the next; they tend to "run together", since so many of them use the same sort of setting and evoke a similar tone. "Sommervilles" doesn't have the same level of rich, dark visuals as some of the more recent shows, but---viewed as a separate entity...is quite an effective gothic murder mystery/with comic overtones. Karloff channels SHEMP; hah!--now that's funny. Notice that some of his Shemp-age was still coloring his moustache and hair in the prologue. A fine and witty performance. Peter Walker is serviceable in his role, hampered only by his somewhat less-than-convincing line delivery. This is "Thriller's" first use of a recycled score; notice the final credit reads "Music Score" and not "Original Music by". Goldsmith's "Guillotine" and "Weird Tailor" were most prominent, with bits n' pieces of his "Beckoning Ghost", "Masquerade", "God Grant.." and (I believe) an act-ending cut from Steven's "Premature Burial" tossed into the mix. 6 (maybe 7) out-of-10 Shemp-Heads (or "knuckleheads, dough-heads, turnip heads..."? I need Moe Howard's advice on this one). I say six big fake Karloff Shemp Heads. What, do you guys actually MISS the lamer crime shows? You want 'em to COME BACK? Well, they are headed your way, and some of them will definitely make you miss episodes like this one. I was a little disappointed at the end thought something more GHOSTLY was going to happened after auntie was "killed"
"The problem with watching a "Thriller" per-day is the difficulty in distinguishing one episode from the next"
44 episodes and NOW you tell us! That's the last time I ignore the surgeon general's warning! For one of the 'crime thrillers', this one emerges to the cream of the crop for me. Such delicious deliveries from a rich cast -- whether its Karloff or Lupino or both, they were able to occasionally draw some great actors, and raise the level of those around them (a close cabinet, not withstanding)... Lupino framed some terrific shots, where two characters would interact tightly in, one looking askewed, creating some nice tension. Whether its my TV, i thought there was some nice usage of shadows and fog, the music steamed in all the right places, and as an added delight, Karloff brought an interesting street-level charm to his portrayal of the good doctor. If all the crime thrillers were this well composed, I dare say Hitchcock may have chose to do his show as Moe. Eight and a half Karloffs! We viewers are treated to a prologue of a middle aged woman delivering an impromptu burial taking place in the middle of the evening. This certainly piqued my interest in what I was about to watch. Shortly after the three main relatives are introduced, you can quickly figure out what the main plot point will be. Sure enough, shortly after nephew Rutherford is rebuffed by his wacky and rich aunt Celia, Ursula proposes her plan to despose of Celia. I enjoyed all of our episodes performers. Celia was just the right combination of loopy ol' biddy. I didn't mind that she took the role over the top at times. Peter Walker did a good job of the terminal loser nephew always trying to wring out money from his friends and family. Phyllis Thaxter was perfect as the ice cold murderess waiting patiently for the pawns in her plan to arrive. 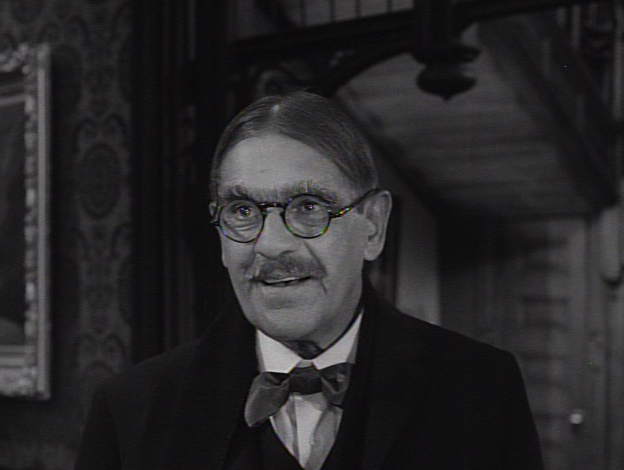 Karloff played his bit role perfectly and his Shemp 'do added a half star to the episode. The plot churned along as predicted, including Ursula's post deed disposal of clueless Rutherford. I was a bit surprised when it was revealed after the reading of the will that the lawyer was Ursula's secret boyfriend. I didn't think that an arctic spinster like Ursula dated. The ending shot with Boris outside the gate of the Sommerville estate telling us the fate of the two schemers was a nice Hitchockian touch. 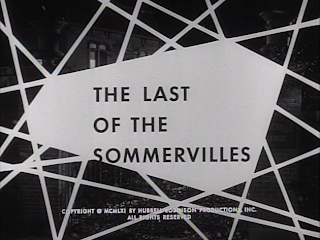 Overall The Last of the Sommervilles was a bit of a routine murder mystery, but still a fun episode and worth of two and a half Karloffs with Shemp haircuts. Worst of the ones Karloff acted in, #52 out of 67 overall. little to do in this. At last we get a Thriller with enough story beats to fill an entire hour. It's surely no accident that this is an original written by Ida and Richard Lupino, and not an adaptation from Weird Tales. For me, that raises the issue that Doug Benton and William Frye may have been talented producers, but they were very poor story editors--and that accounts for the padded feel of so many Thriller episodes. Benton admits as much in his '90s interview (recreated as a commentary in this set.) He explains that Acts 3 & 4 were essentially the original story, while Acts 1 & 2 were left to the assigned writer to invent. That's pretty much the definition of padding. Benton and Fyre gain additional culpability in the fact that Benton screened the WT stories and Frye made the final choices. Anyone who has read through several issues of Weird Tales knows that many of the stories have rather complex plots with MANY story beats. It appears that Benton neglected those and, instead, winnowed out the tales with "punchlines" that may have worked in the '30s and '40s but felt a bit dated by the 1960s. When the Lupinos crafted this episode--regardless of how you feel about their tale spinning--they did understand how much story you needed to fill a television hour, something which consistently eluded Frye and Benton. Though this hour has sufficient plot, on the downside, it is one of the less atmospheric Thrillers overall, and may well be the one that most resembles an Alfred Hitchcock Presents episode. Contrary to the observations of Enfantino and Scoleri (who fell into the tedious trap of trying to outdo one another's smarmy comments in this Thriller oddyssey [sic] -- Karloff Shemp? Please. ), Martita Hunt is an absolute stitch IMO, brilliant overplaying her role. The hilarious wardrobe design, alone, would have shown any thoughtful observer that she was provding precisely what was intended. But why let creative intention interfere with another smug insult? Some terrific observations here, thanks. Considering the structure of this episode, with the Farnham/Karloff epilogue, is it possible that the Lupinos originally intended this as an hour-long Hitchcock, but ended up selling it to Thriller? Hitchcock was still a half hour show at this point. It didn't go to an hour until Fall 1962. You guys have already been scolded for not appreciating the great Martita Hunt -- are you the types that don't know any movies before STAR WARS? Then perhaps you also haven't heard of a 1941 film called LADIES IN RETIREMENT, which starred Ida Lupino in a period thriller about inheritance and a murder plan that has more than a passing resemblance to "The Last of the Summervilles." This was a fine episode, predictable up to a point, but pleasantly surprising when it needed to be, and well acted and directed. Phyllis Thaxter was especially good. I enjoyed this. Celia Summerville looks like the Wicked Witch's OTHER sister, or better yet, like one of the pinheads in Tod Browning's "Freaks", only (as Shirley Temple might say) all growed up. Aunt Celia looks and acts like a slightly more filled out version of Wayland Flowers' Madame, but Dr. Farnham seems to have carried a torch for her for more than half a century. Guess there's someone for everyone. I love the tracking shot of the cord from the lamp to the sponge. Electricity.